Any person growing up in New Jersey has often felt the need to get out of New Jersey. And while some act on this desire and move to another state, many – myself included- are fated to stay in the Armpit of America forever. This constant struggle of wanting to get out but realizing you never will is perfectly exemplified by the board game “Escape from New Jersey.” Not sure where else you can find it, but I got mine at True Jersey Supply Company, a store in Belmar full of all things Jersey. As you can see above, Escape from New Jersey isn’t technically a board game. It’s more of a laminated piece of paper that comes in a cardboard tube, so you’ll need to weigh down the corners to keep it from rolling back up. And rather than having real game pieces, you just get cheap plastic cowboys and Indians that can’t even stand up on their own. Yeah, the whole thing is pretty flimsy. Flimsy, but fun. 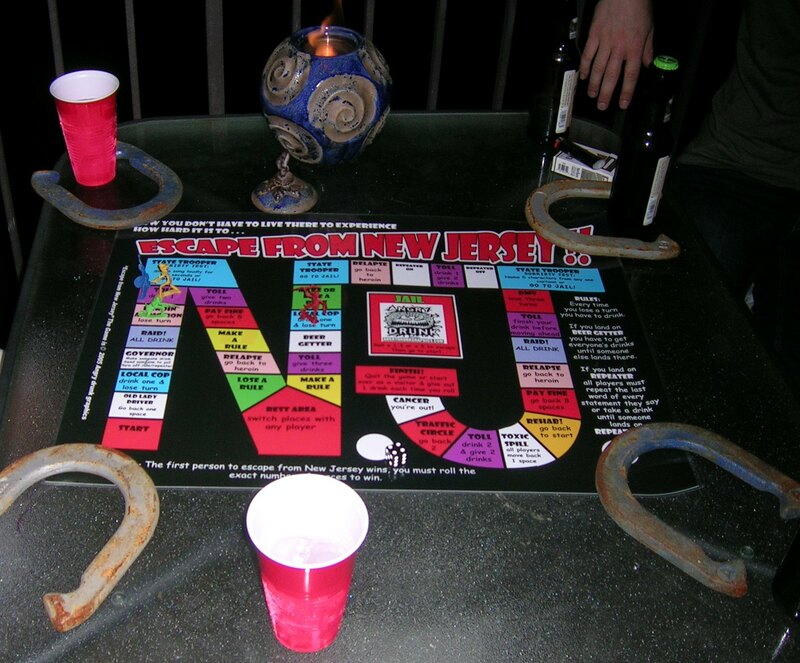 Escape from New Jersey is a lot like any typical drinking game; you’re expected to take drinks, force other people to drink, and make up dumb rules that if not obeyed cause you to drink even more. 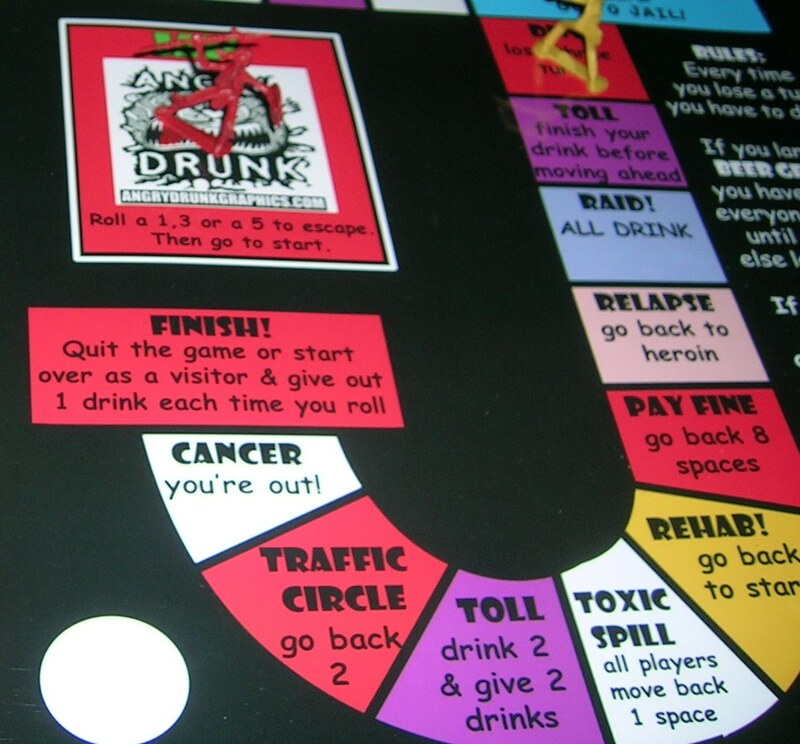 But what makes the game special is all of the Jersey-centric items on the game board. For instance, land on the Governor square and, just like Chris Christie, you get to make up your own rules. Get stuck at the DMV and lose three turns. Enter a traffic circle and go back two spaces. Encounter a toxic spill and everyone loses a turn. As the game progresses, though, it gets kind of annoying with all of the different rules. And the drunker you get, the harder it is to follow all those stupid rules. You get to the point where you just want someone to win so the game will end. However, you soon realize that winning is pretty much impossible. The last stretch of the game ensures that no one will ever reach the final square. All in all, the lesson learned here is that, whether a game or real life, there is no escape from New Jersey. Ever. This entry was posted on November 25, 2011 at 1:52 pm and is filed under Random. You can subscribe via RSS 2.0 feed to this post's comments.